A catastrophe that was responsible for relieving centuries-old tensions between Moscow and Warsaw is now rekindling age-old suspicions once again. The shock of that tragic April morning will not be easily forgotten. President Lech Kaczynski, his wife Maria and a generous portion of the country’s elite were traveling to Smolensk, Russia, on April 10, 2010 to commemorate the 70th anniversary of the Katyn massacre. Tragically, the plane that was carrying the Polish delegation crashed while attempting to land in bad weather, killing all of the passengers aboard. 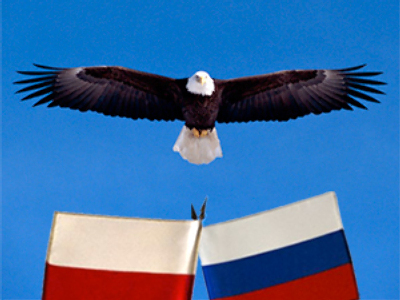 But what seems to have been a tragic accident of incredible proportions is beginning to take on political, even conspiratorial overtones as some Poles – especially those close to the late president – are suggesting that Russia had a deliberate hand in the crash. Even after Russia last week submitted a detailed report on the causes of the crash of the Tupolev Tu-154, the family of Lech Kaczynski said Monday that Moscow may have plotted to assassinate the late president. "Today the hypothesis of an assassination plot against the Polish president is more plausible than ever," Marcin Dubieniecki, the husband of the late Kaczynski's only child, Marta, told Polish media. "There are many things indicating that (Russia would have wanted) to assassinate Lech Kaczynski," Dubieniecki told Poland's TVN24 news channel. Kaczynski was known for harboring deep suspicions of Russia, and focused Poland’s foreign policy on strengthening relations with the United States, occasionally at the expense of his European neighbors. Kaczynski’s son-in-law points to these political choices as reasons for Moscow wanting to assassinate the late Polish president. According to Dubieniecki, Moscow may have been motivated by "the possible re-election of president Lech Kaczynski, revenge for (his backing) Georgia and by Russian interests in relations between Moscow and the European Union." Kaczynski's surviving twin and leader of the rightwing Law and Justice party (PiS), Jaroslaw Kaczynski, has also expressed strong opinions on the Russian report, saying it "made a mockery of Poland." Meanwhile, Polish Interior Minister Jerzy Miller, who is overseeing Poland's governmental commission on the crash, said in a press conference on Tuesday that air traffic controllers of the Smolensk Severny Airport were operating under heavy pressure, made many mistakes and did not provide support to the crew while attempting to land in complicated conditions. A Russian aviation source told Itar Tass that the Polish investigating team was quoting out of context certain phrases from conversations between the Polish presidential crew and the Smolensk Severny Airport tower. "Poland distorts events rather than reconstructs them," the source close to the air crash investigation said, adding that the Polish side has not published the entire cockpit transcript between the pilots and Russian air controllers as promised. 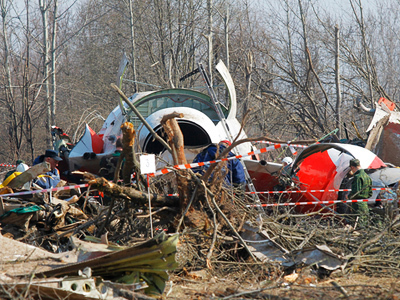 In the report by the Interstate Civil Aviation Committee, Russian investigators blamed the catastrophe on several factors, including the actions and experience of the pilots [it has been reported that one of the pilots had traces of alcohol in his blood], excessive pressure to land the plane from individuals not authorized to be inside of the cockpit, and a determination to land despite warnings of dangerous weather conditions by Russian air controllers. The investigation also ruled out the possibility of mechanical failure as a cause of the crash. "There was no failure of the plane or its engines and system in flight," IAC chairwoman Tatyana Anodina said, "nor were there any midair fire or blasts before the collision with the ground." The IAC chairwoman said the actions by air traffic controllers in Smolensk and the technical conditions of the Smolensk-Severny airport were not among the causes of the accident. Dubieniecki, however, said the Russian investigation failed to take into account an attempt by the Polish pilots to regain altitude and abort the landing 22 seconds prior to the crash. The landing attempt "failed because the crew was misinformed about the plane's altitude and about the position of the landing course and path," Dubieniecki charged. But not everybody in Poland is buying the conspiracy theories. Former Polish President and Nobel Prize Winner Lech Walesa, for example, said that Poland deserves the greater share of the blame for the crash. Walesa was quoted by Gazeta Wyborcza, the Polish daily, as saying. “There was only one mistake on the other [Russian] part – they had to forbid landing, and if not, then shoot so as to scare [the plane] away." According to international standards, pilots of international flights are ultimately responsible for the decision to land or not to land. Air traffic controllers provide the necessarily flight conditions, and offer their advice, but they may not deny the pilots' right to land if such a decision has been made in the cockpit. Walesa added that the Polish flight crew was stuck in a “hopeless situation” because there was so much pressure on them to land the plane despite numerous warnings of bad weather and poor visibility. Some observers had been predicting that a Polish-Russian fix, especially one that involved a profound tragedy, was too good to be true. When Prime Minister Vladimir Putin and his Polish counterpart Donald Tusk exchanged a solemn hug at the site of the crash, it was as if 200 years of mutual enmity between Poland and Russia had suddenly evaporated like tears. Thanks to the "hug felt around the world," Russia had acquired a human face in Poland’s eyes. Regrettably, however, not everybody still sees things that way.